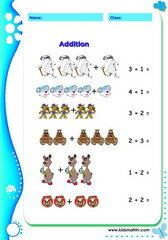 Addition worksheets for children on: basic addition facts, adding objects, addition with picture aids, addition word problems, addition applied to daily activities, addition of single digit numbers, addition of two place numbers, addition of three place numbers and more on addition. 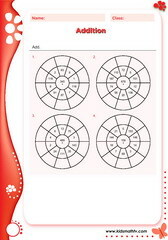 These worksheets are in PDF format and being online means they can be printed as many times as possible. Great resources for teachers and parents to supplement their children's course. 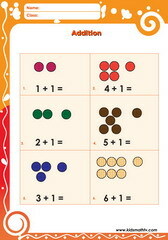 Practice Add 1 to other numbers 6 to 10 with dots with this worksheet. 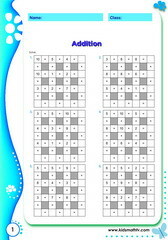 Practice Add 1 to other numbers up to 10 with pics with this worksheet. 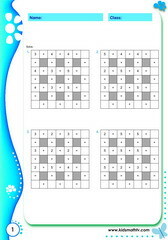 Practice Add 1 to other numbers up to 6 with pics with this worksheet. 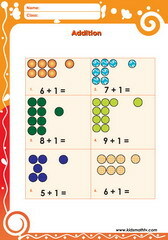 Practice Add 1 to other numbers up to 6 with dots with this worksheet. 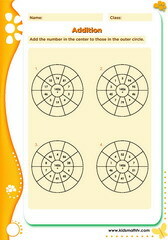 Practice Add single digit numbers with this worksheet. Practice Adding doubles with this worksheet. 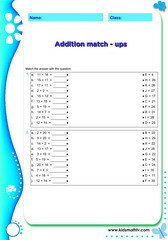 Practice Addition match making with this worksheet. 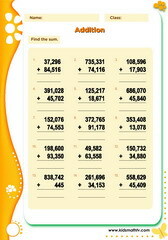 Practice Addition sentence with this worksheet. 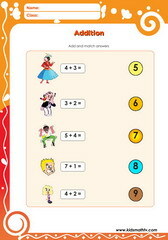 Practice Addition shoe match with this worksheet. 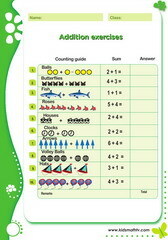 Practice Addition up to ten with this worksheet. 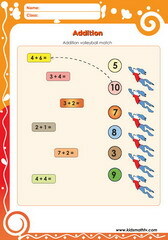 Practice Addition volley ball with this worksheet. 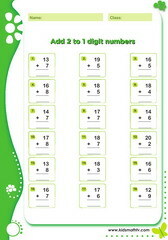 Practice Add 2 to 1 digit numbers with this worksheet. 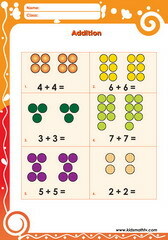 Practice Adding 1 to ther numbers no illustration with this worksheet. Practice Adding doubles 2 digits with this worksheet. Practice Adding double digits with this worksheet. Practice Adding to get 8 with this worksheet. 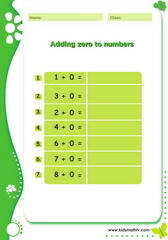 Practice Adding zero to other numbers with this worksheet. 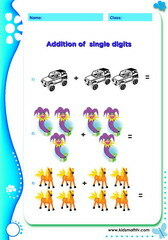 Practice Addition of single digt numbers up to 20 with this worksheet. 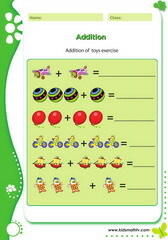 Practice Addition of toys with this worksheet. Practice Addition of two digit numbers with this worksheet. 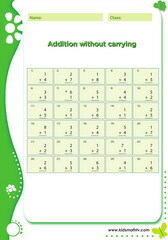 Practice Addition with carrying with this worksheet. 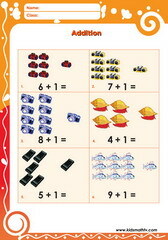 Practice Addition with pics sums with this worksheet. Practice Addition word problem with this worksheet. 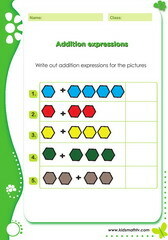 Practice Addition expressions with this worksheet. 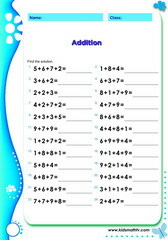 Practice Addition horizontally arranged numbers sheet1 with this worksheet. 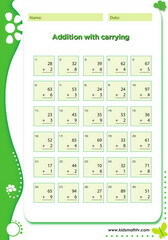 Practice Addition horizontally arranged numbers sheet13 with this worksheet. Practice Addition horizontally arranged numbers sheet2 with this worksheet. 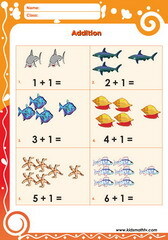 Practice Addition in threes with this worksheet. 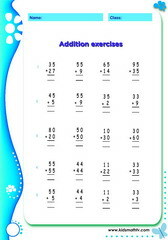 Practice Addition one digit vertically with this worksheet. 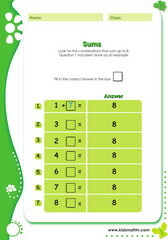 Practice Sums sentence word problems with this worksheet. Practice Sum up with this worksheet. Practice Addition 3 to 1 digit numbers with this worksheet. 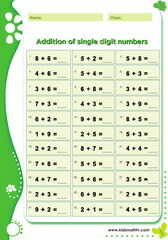 Practice Add 2 4 digit numbers with this worksheet. Practice Addition of 5 plus 5 digit numbers with this worksheet. Practice Addition 2 to 3 digit numbers with this worksheet. Practice Addition circle drill with this worksheet. 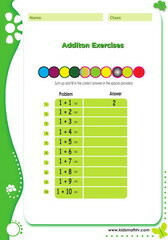 Practice Addition daily facts with this worksheet. 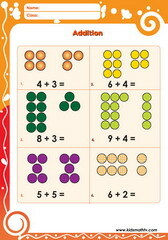 Practice Addition magic square exercise with this worksheet. Practice Addition matchup exercises 1 with this worksheet. 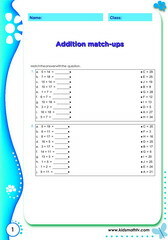 Practice Addition matchup exercises 2 with this worksheet. Practice Addition of 2 3digit numbers with this worksheet. 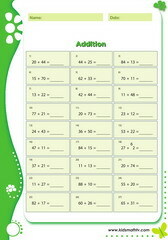 Practice Addition of 2 digit numbers with this worksheet. 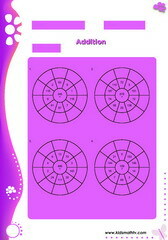 Practice Addition of 3 and one digit numbers with this worksheet. 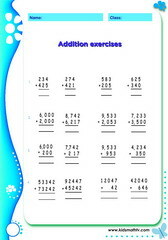 Practice Addition of 5 and 4 digit numbers with this worksheet. Practice Addition two to three digit numbers with this worksheet. 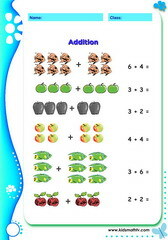 Practice Addition balance equations with this worksheet. Practice Addition horizontally arranged numbers with this worksheet. Practice Addition of 2 3 digit numbers with this worksheet. 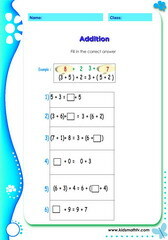 Practice Addition of 2 numbers with this worksheet. 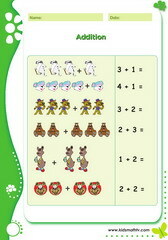 Practice Addition puzzles lower with this worksheet. Practice Addition sentence word problems with this worksheet. Practice Addition word problem equations with this worksheet. Practice Addition 5 digits with this worksheet. Practice Addition 5 digits horizontally with this worksheet. Practice Addition circle drils with this worksheet. 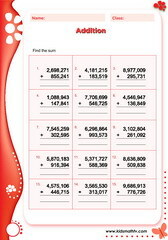 Practice Addition of 3 four digit numbers with this worksheet. Practice Adding money with this worksheet. 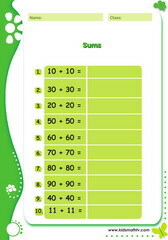 Practice Addition of 3 numbers with this worksheet. 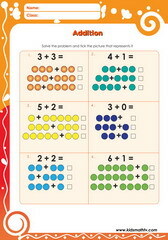 Practice Addition of 4 numbers with this worksheet. 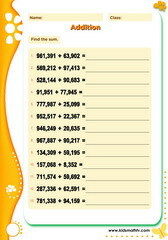 Practice Addition up to hundred thousands with this worksheet. Practice Addition up to millions with this worksheet. Practice Addition with regrouping with this worksheet. Practice Add money with this worksheet.